Payal is getting ready. She smiles recalling the last time when she was getting ready for her wedding with Pushkar. She thinks of her face change. Everything is happening at such a fast pace. I feel as if I have gotten my life back. She prays to Kanha ji to keep Pushkar at bay from her happiness. Pushkar enters in the house in the disguise of a servant. I am here Vidhita! Kabeer comes to meet Payal. I was thinking to make out for the old dues before we start a new relation. You promised to pay me for all the expenses that I have spent on you for your treatment. I don’t want money though. He leans closer for a kiss but she pushes him away. He tells her he is hers now. If you don’t like anything that I do or say, simply walk up to me and tell me. I will change myself. She hugs him. You have proved yourself to me long ago. You have every quality that I always wanted in my husband. The biggest thing is that you are my best friend. He smiles. Inspector asks constables about Constable Singh. One guy says he might have gotten late. They see Pushkar still sleeping. He does not react when they call out to him. Inspector asks constable to open the cell. Meera and Max exchange rings. Constables are stunned to see Constable Singh lying dead in Pushkar’s cell. They remove their caps. Kabeer and Payal also exchange rings. Rajshri receives call from Inspector just then who informs her that Pushkar has escaped from the prison. Lights go off just then. By the time lights come on, Payal is missing. Rajshri tells Kabeer it is Pushkar’s doing. She tells him everything. They hear Payal’s scream and turn. Pushkar points gun at Payal’s head. Kabeer takes a step in his direction but Pushkar warns him against it. Payal hits Pushkar but he ends up hitting her on her head. Kabeer tries again and is shot on his hand. Everyone gets concerned for him but he tells them he is fine. Payal and Pushkar have disappeared by then. Inspector enters just then and informs them that Pushkar must be inside only. We are coming from outside and he wasn’t there. They start looking inside the house. Pushkar takes Payal in a room. Kabeer asks Rajshri where Pushkar could be if he isn’t outside or inside the house. Pushkar drops the gun seeing Payal unconscious and shifts some furniture closer to the door to keep everyone outside. Payal opens her eyes and notices the gun lying on the floor. Rajshri comes to her room and takes her gun. Pushkar turns just when Payal was about to pick the gun. They struggle for the gun. She tells him she wont win this time but he tells her he has a bad habit of winning. A bullet is fired at the roof. Rajshri walks out of her room with the gun. Pushkar manages to win from Payal and aims the gun at her. He tries shooting her but there are no bullets. She runs in another direction. Rajshri heads upstairs. She stops at a window but cannot open it. She picks a show piece kept nearby. Pushkar tells Payal not to escape from death anymore. I will kill you all the more mercilessly if you will try to run harder. She replies that she isn’t that scared Vidhita anymore who will get afraid of him. I am a changed woman, I am Payal now! He wrestles with her as she holds a big stick and tries attacking him. He pushes her away. Changing your face wont change anything. You are destined to die by my hands only! Pushkar is about to hit Payal when Rajshri warns him to stop. He turns and finds his mom pointing a gun at him. Pushkar asks his mother if she will shoot her own son. She replies that he has killed many innocent people just because she was blinded by her motherly love. My hands wont shake today if I have to shoot you! She asks Payal to come towards her but Pushkar keeps the stick pointed at her. He tells his mother these words don’t suit her. I know my mother can never shoot me. She refuses to acknowledge him as her son. You are a devil right now. He says I only thought of your happiness my entire life. How can I be a devil then? I turned into a devil for you only. Dad left you, left us. What was my or Meera’s fault? I had decided then itself that I wont let this spread in my family. I decided I will make my family a perfect family and wont let anyone trespass my rules. Vidhi broke my rules and my family. Rangeela and others try to open the door. Pushkar says this girl dint give me my perfect family. Rajshri negates him. It was okay to leave her if you couldn’t gel with her. There was no point killing her. It is I who is a culprit here who couldn’t recognize her son is a devil! Rangeela and Kabeer try breaking the door. Pushkar asks his mother if she is leaving him for Payal today. She says this is what society has been doing till date but today a mother is supporting a woman. It is important that devils like you die so the women can live peacefully. Pushkar is still certain his mom wont shoot him ever. Vidhi is my prey. Even you wont be able to save her from me today! Rajshri recalls all the moments spent with him and gets emotional. Pushkar lifts the stick to harm Payal when Rajshri shoots him. Pushkar falls down. Rajshri drops the gun and shouts Pushkar’s name. She keeps his head in her lap. Everyone manages to come upstairs by now. Rajshri is in tears. Pushkar tells his mother he loved her the most. Please don’t hate me. I couldn’t become your good son but I love you. He breathes his last. Rajshri cries her heart out. A diya is lit before Pushkar’s photo. Kabeer and Payal exchange rings in the presence of everyone. They seek Rajshri’s blessings. Rajshri hugs them. 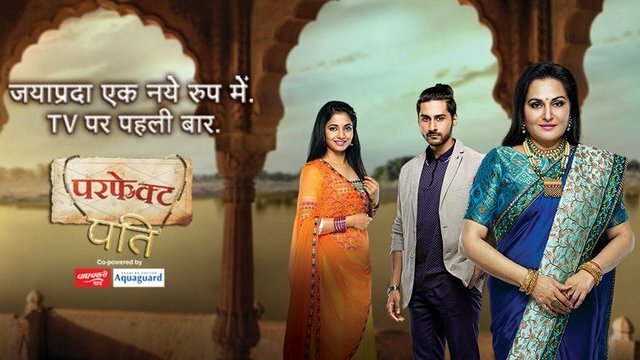 The post Perfect Pati 27th February 2019 Written Episode Update: A Happy Ending appeared first on Telly Updates.